Next Post > Top 37 Natural Home Remedies For Dark Neck Skin – How They Work? Dark spots or black spots or age spots are discolored patches of skin, which can appear on the face, arms, back or shoulders. 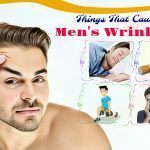 Excess production of melanin on the skin, lack of sleep, hormone imbalance, certain medications, pregnancy, vitamin deficiencies and stress are some of the main reasons for dark spots. This problem can be embarrassing and cause low self-esteem. Thankfully, there are a lot of possible treatments such as laser surgeries and acid peels. 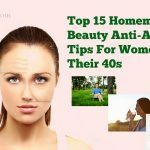 Besides, you can also use the natural solutions listed in this article on our site, Beauty Talk, to lighten them naturally. 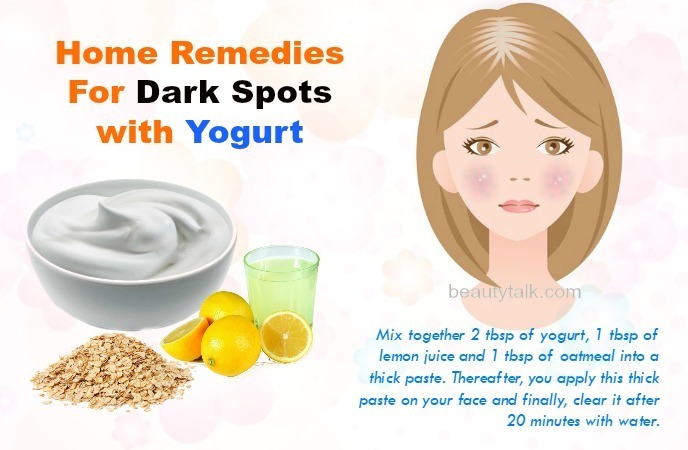 Keep reading to learn about many effective home remedies for dark spots. How To Treat Dark Spots Naturally? 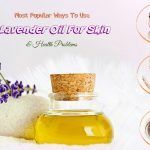 Here are top 53 science-based most simple & effective home remedies for dark spots, which are easy to prepare and apply at home to cure this skin problem. 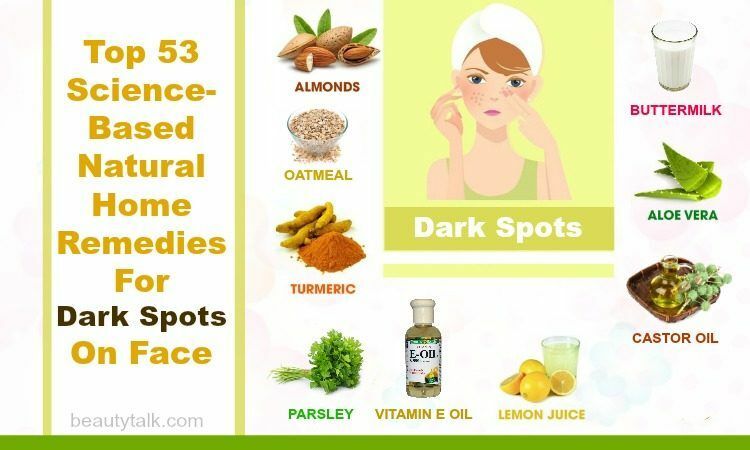 These home remedies for dark spots are safe and do not contain side effects. However, all the information in this article is intended to provide informational purposes. It is not intended to replace medical advice. So, you should consult a doctor or healthcare professional before using any remedy. Take some buttermilk and pour it into a small bowl. Directly apply the buttermilk onto your face with a cotton ball and wash off after 20 minutes with clean water. Try this tip every day for quick results. Mix buttermilk (4 teaspoons) and tomato juice (2 teaspoons) thoroughly in a clean bowl. Thereafter, start applying this combination all over the face. Finally, wash off after thirty minutes with clean water. You should follow this process regularly. The first step is taking an aloe vera leaf and slicing away its outer layers with a knife. The next step is squeezing the gel onto the fingers and applying it directly to the dark spots. Keep the gel on your face for 20 minutes and use clean water to wash it off. Follow this way daily. Both lemon juice and aloe vera contain bleaching properties that act wonders to remove the dark spots, thereby leaving the skin bright and glowing while sugar functions as an exfoliator to remove dead skin cells. You put ½ cup of aloe vera gel, 2 tbsp of lemon juice and 1 tbsp of sugar in a clean bowl. Later mix thoroughly and scrub this mixture onto the face with clean hands. Wash off after 10 minutes with clean water and apply a moisturizer. Try this remedy every alternate day. This remedy works excellently in fading dark spots. You mix honey (1 tablespoon), ground up oatmeal (3 tablespoons) and milk (1 tablespoon) in a bowl until it turns into a paste. 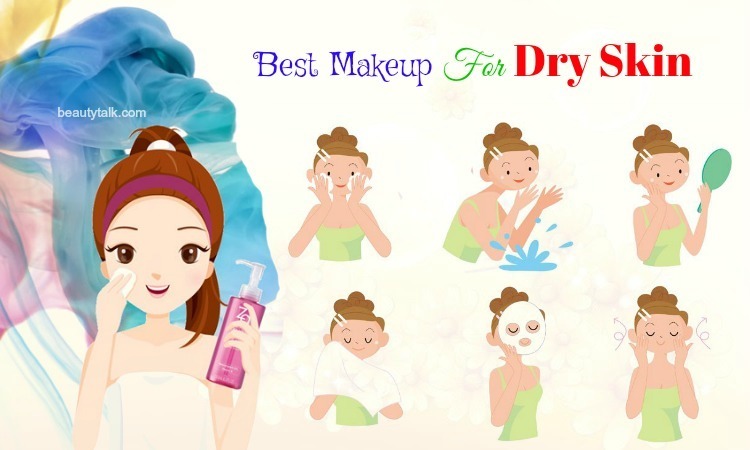 Afterward, apply this resultant pack all over the face and let it dry completely. Finally, clean your face with clean water. This pack can be applied three times weekly. Firstly, mix turmeric (1/2 tsp), ground up oatmeal (2 tbsp), green tea leaves (1tsp) and gram flour (1 tbsp) in a bowl. Make a thick paste by adding enough water to the mixture and now apply it on your face. Allow it to dry completely and wash off using clean water. Follow the process twice each week. 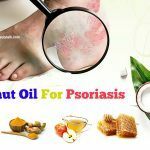 Take several drops of almond oil and rub it between your fingers. Then, apply it on your face as a lotion. Don’t wash off. Do this process nightly before going to sleep. In a clean bowl, you mix almond oil (4-5 drops), lime juice (2 teaspoons), milk powder (1 tablespoon) and honey (1 teaspoon). Then, apply this paste on your face and keep it on for 30 minutes. Thereafter, clear the face with clean water. Use this remedy three times weekly. In a small cup or bowl, add almond oil (1 teaspoon) and vitamin E oil (2 drops). Later heat this oil mixture in a microwave for ten seconds and afterward, apply on your face. Gently rub it for ten minutes in circular motions and wipe away by using a soft washcloth. It is advised to follow this method nightly prior to your bedtime. Mix together ½ tsp of turmeric, 2 tbsp of milk and 1 tsp of lemon juice in a bowl. Then, apply this thin paste all over the face and gently massage it onto the affected areas. After fifteen minutes, wash off using clean water. Try this treatment every alternate day. The first step is mixing ½ tsp of turmeric, 1 tsp of olive oil and 1 ½ tbsp of yogurt in a bowl. The following step is applying this mixture on your face and massaging the affected areas in circular motions for 20 minutes. Thereafter, cleanse your face with clean water. For best results, follow this cure three times weekly. At first, boil chickpeas (1/2 cup) in water (1/2 cup) until they’re completely soft. Blend the chickpeas & water until you attain a thick paste. Begin applying it all over the affected areas and wash off after half an hour using clean water. You can use this remedy daily. Mix together 4 tbsp of chickpeas paste and 3 tbsp of lemon juice in a bowl until they create a thick paste. Thereafter, apply this resultant paste all over the face and after 20 minutes, remove it using clean water. You can use this remedy every alternate day. Firstly, chop up 1 head of parsley on two cups of water for around 10 to 12 minutes. Next, strain the water into 1 clean bowl and then, add lemon juice (1 tablespoon) to this parsley water. 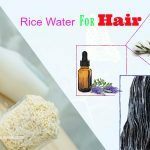 Afterward, apply this mixture directly on your affected areas with the cotton balls and finally, use clean water to remove it after 30 minutes. For visible results, follow this process every night before your bedtime. Chop up 1 head of parsley at first and add some water to it. Then, blend it up to create a paste and afterward, add 1 tsp of lemon juice and 2 tsp of honey to the paste. Mix them thoroughly and now apply this solution all over your face. Wait for the duration of 20 minutes and wash off using clean water. Try this remedy every alternate day. 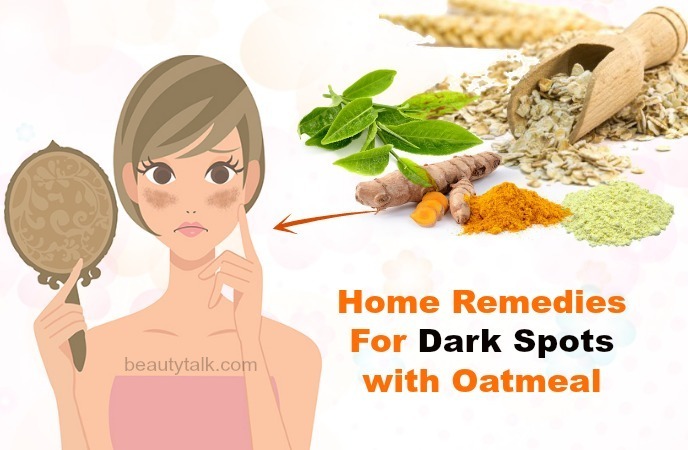 Keep reading this post to learn about other home remedies for dark spots! 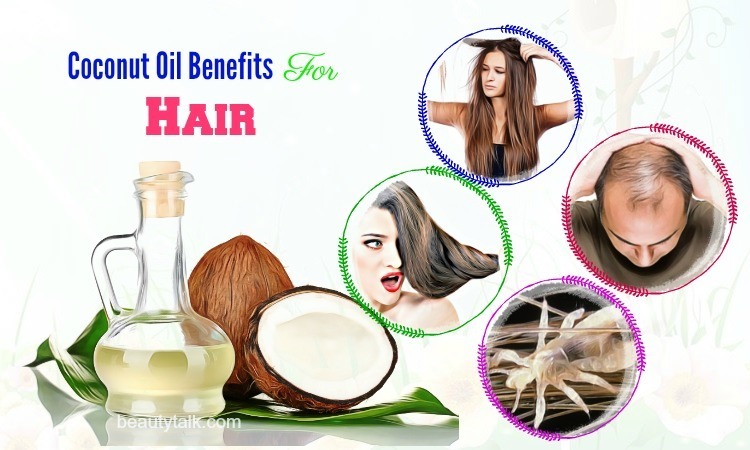 Take castor oil (4-5 drops) and pour it on a cotton ball. Directly apply on your dark spots and wash off after 30 minutes with clean water. Follow the process two times daily, once after waking up & once before hitting the bed at night. In 1 clean bowl, mix 10 drops each of coconut oil and castor oil together. Then, apply this resultant oil mixture on your dark spots with the aid of a cotton ball. Let it stay on your face for fifteen minutes and clean it using warm water. Follow this method nightly before going to sleep. Take a lemon and squeeze its juice into a clean bowl. Next, add equal amounts filtered, clean water to that lemon juice and apply this mixture on your face with a cotton ball. Use water to wash off after the duration of 20 minutes and remember to don’t use soap. For effective results, repeat this way every alternate day. Take a lemon and squeeze its juice into a clean bowl. To it, add 1 tbsp of yogurt and mix these things well. After that, apply all over your face with this paste and clear it after 30 minutes with clean water. 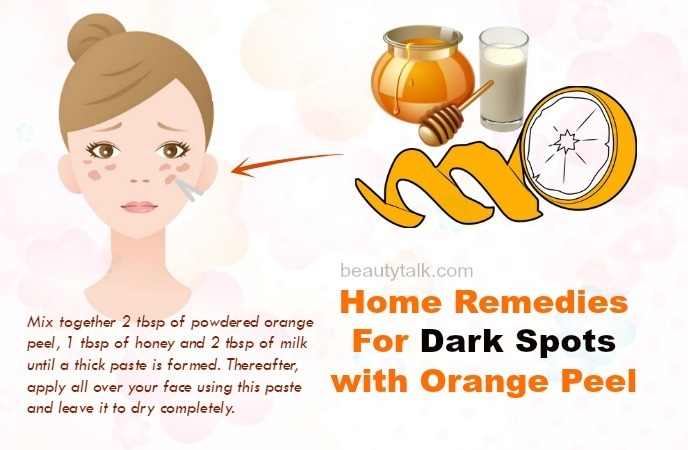 Follow this simple remedy two times weekly until the dark spots are removed completely. Take a half lemon and squeeze its juice into a clean bowl. Then, add 1 tsp of sugar to that lemon juice and mix them well. Rub this resultant mixture between the fingers and after that, scrub all over your dark spots using circular motions. Keep scrubbing for 2 minutes. Use clean water to wash off and pat dry. Use the remedy one time each week. Take several drops of vitamin E oil and apply it directly on your dark spots. Use clean fingers to rub it into the skin. Try repeating this process every day before going to sleep. Take a vitamin E capsule and break it to extract its oil. Later apply the oil directly to your affected areas. Try this daily before your bedtime. Finely grate 1 potato at first and later add 2 tbsp of honey to get a paste. Then, apply this mixture on your dark spots and remove it after twenty minutes with warm water. For fast results, follow this remedy every day. The first step is blending 2 tbsp of tomato juice and 1 tbsp of honey into a paste. The next step is applying the resulting paste to your problem areas with a cotton ball. Let it dry and afterward, wash with warm water. To get rid of dark spots soon, follow the process twice every day. Mix 1 tbsp of dried & powdered orange peel and 2 tbsp of yogurt into a paste. Thereafter, start applying all over your face with the paste and wash after 25 minutes with water. Try this remedy daily for visible results. Mix together 2 tbsp of powdered orange peel, 1 tbsp of honey and 2 tbsp of milk until a thick paste is formed. Thereafter, apply all over your face using this paste and leave it to dry completely. Lastly, wash off using warm water and follow the remedy every day. The first step is to blend 1 tbsp of honey and 4 to 5 strawberries into a thick paste. The next step is to apply all over your face with this paste. Leave it on for around 40 minutes and wash off using warm water. Repeat the process every alternate day. Take 3 to 5 strawberries and mash them into a pulp with a fork. To the crushed strawberries, add 1 tbsp of apple cider vinegar and afterward, apply the paste on your face. Let it settle for 20 minutes and wash off with water. This remedy should be used two times weekly. First of all, blend ½ onion and 3 garlic cloves and later strain out their juice. Apply this juice on the dark spots with a cotton ball. Let it dry naturally and wash off using water. It is advisable to follow this remedy nightly before your bedtime. In a clean bowl, combine 1 tbsp of onion juice and 2 tbsp of honey. Use a cotton ball to apply this mixture to your face and wash off using water after 30 minutes. For quick and effective results, repeat this method every day. Make a thick paste by mixing 1 tbsp of onion juice, 1 tbsp of rose water and 2 tbsp of gram flour in a clean bowl. Then, apply this pack all over the face and remove it after 30-35 minutes with water. Apply this pack three times weekly for visible results. In addition to skin benefits, onion juice can boost treat hair loss. 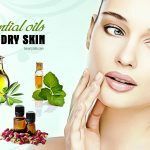 There are many other effective home remedies for dark spots in this article, continue reading it to discover more! Dilute 1 tsp of ACV with 1 tsp of water at first and later add 1 tsp of honey to it. After that, apply this mixture to your affected areas with a cotton ball and wash after 15 minutes with water. For quick results, follow this simple method every day. Mix 1 tsp of ACV with 2 tbsp of orange juice in a clean bowl. Thereafter, apply this mixture all over the face by using a cotton ball. Let it dry and wash off using water. You can use this remedy every alternate day. Blend ¼ of a pineapple at first and later strain out its juice. Then, apply this juice on your problem areas with a cotton ball and keep it on until it dries totally. Finally, wash off with water. For effective results, follow this way every day. Firstly, combine freshly squeezed pineapple juice (2 tablespoons) and yogurt (2 tablespoons to make a thick paste. Thereafter, apply this paste all over the face and wash after 25 minutes with water. To get rid of dark spots fast, follow this remedy thrice weekly. 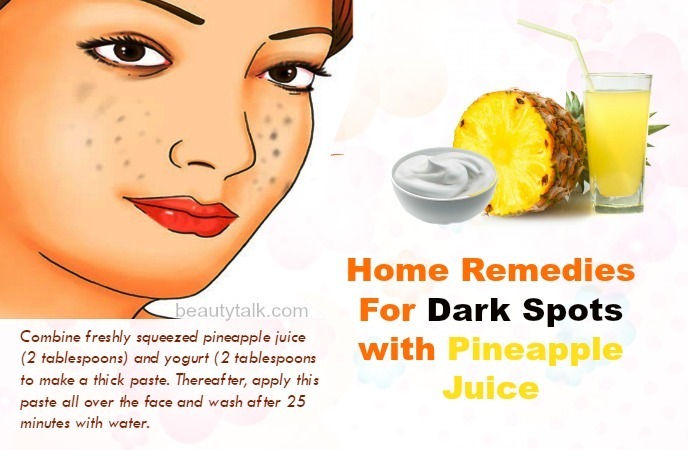 Along with that, pineapple juice is also amazing home remedy for wrinkles above your lips. Mix 2 tbsp of sandalwood powder, 4 drops of vitamin E oil and 3 tbsp of orange juice in a clean bowl until you attain a thick paste. Start applying this paste on your problem regions and after thirty minutes, wash off using water. Repeat this treatment every alternate day for best results. Mix 1 ½ tbsp of sandalwood powder, 1 tsp of glycerin and 2 tbsp of milk in 1 clean bowl to make a thick paste. Begin applying on your face with this paste and remove after 30 minutes with water. Try following the procedure thrice each week. Firstly, blend ½ a papaya until it turns into a thick paste and later apply it on your face using this paste. Wait for 20 minutes and wash off using water. It is suggested to follow this remedy three times weekly. At first, mash up ½ a papaya using a fork in a clean bowl and mix in 2 tbsp of oatmeal and 1 tsp of coconut oil to get a thick paste. Begin applying on your face and use clean water to remove it after 30 minutes. For quick results, try this three times weekly. Additionally, papaya is also used in addressing many other beauty issues. Mix2 tbsp of tomato juice and 1 tbsp of lemon juice in 1 clean bowl. After that, with the aid of a cotton ball, apply this juice mixture all over the face. Let it dry and wash off with water. You can use the remedy daily. Firstly, pour sugar (1 tablespoon) on a flat plate. Next, take a tomato slice and then immerse it in the sugar until a side of this slice is covered with it completely. Start to scrub your face with that sugar-covered side for 10 minutes in circular motions. Keep it on for another ten minutes and afterward, remove with water. Follow regularly for fast results. Besides, tomatoes are also a wonderful home remedy for acne scars. The first step is mixing 4 tbsp of milk and 2 tbsp of honey in a bowl. The next step is applying all over your face using this paste with the help of a cotton ball. Massage it gently into your dark spots for 10-15 minutes in circular motions and keep this application on for another ten minutes. Finally, clean your face with water and follow this remedy daily. Mix 2 tbsp of milk, ½ tsp of turmeric and 1 tbsp of sandalwood powder in a bowl to create a thick paste. Later apply on your face and leave it to dry. Finally, rinse off with water. Repeat every alternate day for quick results. Take 1 cucumber and blend it to a pulp. Then, add 1 tbsp of lemon juice and ½ tsp of aloe vera gel to this cucumber pulp. After that, apply this mask all over the face and wash after 30 minutes using water. To fight dark spots completely, follow daily. Firstly, blend 1 cucumber with 2 tbsp of yogurt with a blender to create a thick paste. Begin applying this paste on your affected parts and wash off after 40 minutes with water. Repeat this treatment daily. In addition, cucumber can also help you get a smooth facial skin. Mix together 2 tbsp of yogurt, 1 tbsp of lemon juice and 1 tbsp of oatmeal into a thick paste. Thereafter, you apply this thick paste on your face and finally, clear it after 20 minutes with water. Repeat this remedy thrice each week. At first, blend 2 tbsp of yogurt, 1 tbsp of rose water and 1 tbsp of mint in a blender into a paste. Then, you just need to apply the paste on your face and after that, wash off with water after around 40 minutes. Try this cure daily. Chop up a horseradish at first and later blend it in a blender. Add some water to it to make a paste. Then, apply the horseradish on your affected areas and leave it on for around 20 minutes before washing off with water. Regular application of this paste will help you remove dark spots fast. Take 1 horseradish and blend it to a pulp. To this horseradish paste, add 1tbsp of apple cider vinegar and mix thoroughly. Then, apply all over the face using this paste and wait for 30 minutes before washing off with water. Try this remedy thrice each week. Note: Lactating and pregnant women should avoid horseradish because it can cause miscarriage as well as other complications. Take some calamine lotion and apply it to all your face with a cotton ball. Keep it on all night and the next morning, wash it off. Follow this simple remedy every day. Potatoes can do wonders for the skin. They come with sugar and starch, which eliminate dead skin cells and promote the growth of new skin cells. Being enriched with potassium, zinc, phosphorus, vitamin B6 and vitamin C, potatoes rejuvenate the production of collagen in your skin. According to Bill Gottlieb’s “Alternative Cures” book, potatoes are useful in removing acne. There are many various ways to remove dark spots with potatoes. Read on below to understand more. 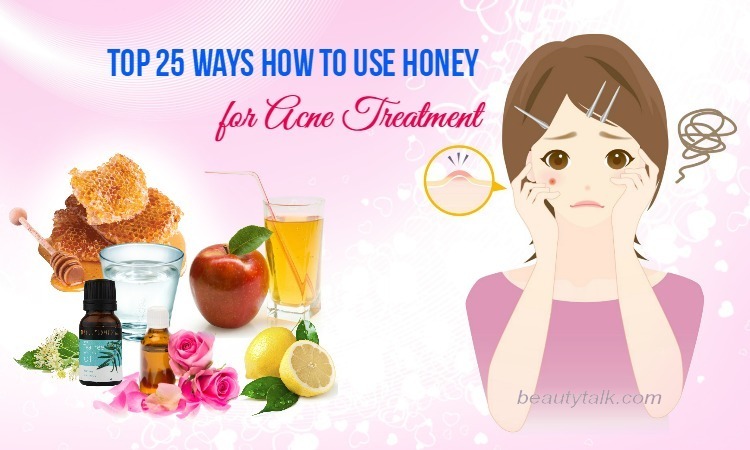 A combination of honey and potatoes makes it one of the best face masks that can remove dark circles on the face. Grate 1 potato to get a fine texture and to it, add 1 tsp of honey. Then, apply this mask all over your face. Let it settle for fifteen minutes and wash off using clean water. Try this remedy every alternate day. Take 1 potato and slice up it into thin slices with the help of a knife. Make the potato slice wet by adding some water to them and then, place them on your dark spots. Leave this application on for the duration of 10 minutes. Follow this remedy every day. Take a potato and slice up it into thin slices. Then, soak these slices in 1 cup of hot water and let these slices soak for 30 minutes. Remove them and add 1 tbsp of lemon juice to it. Afterward, refrigerate this mixture for 60 minutes and now apply it directly to your dark spots with a cotton ball. After 20-25 minutes, wash off using clean water. Follow this treatment twice daily. Besides, potatoes are also an effective treatment for sebaceous cysts. 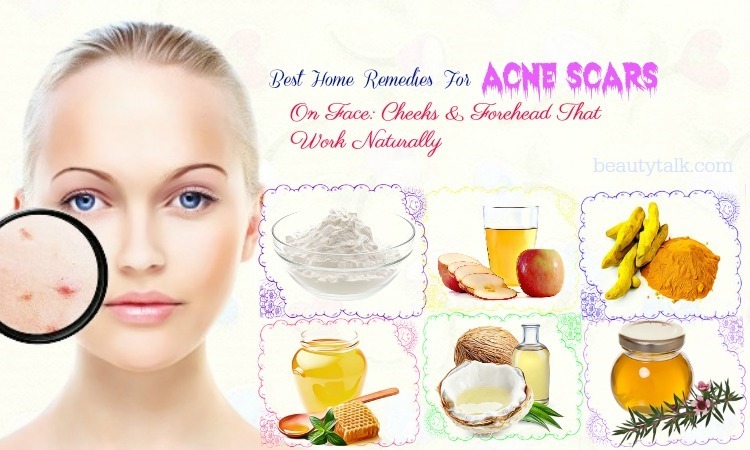 In fact, all of the above home remedies will help you fade away dark spots effectively. These home remedies for dark spots will make the skin spot-free and clear in a matter of several weeks. 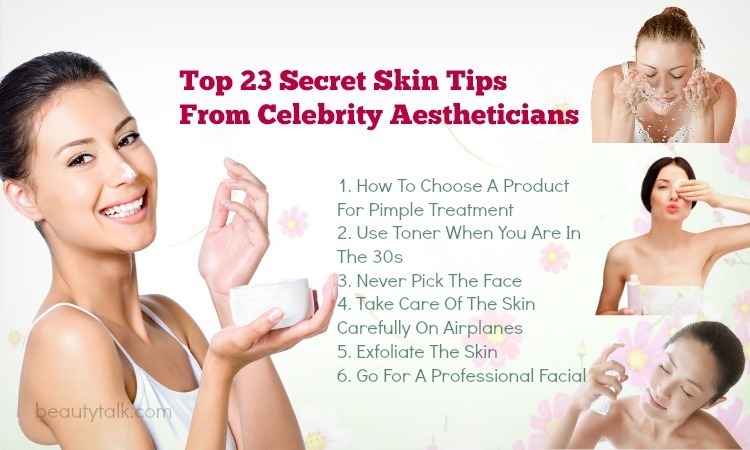 They will make your skin become softer, healthier and start to glow. 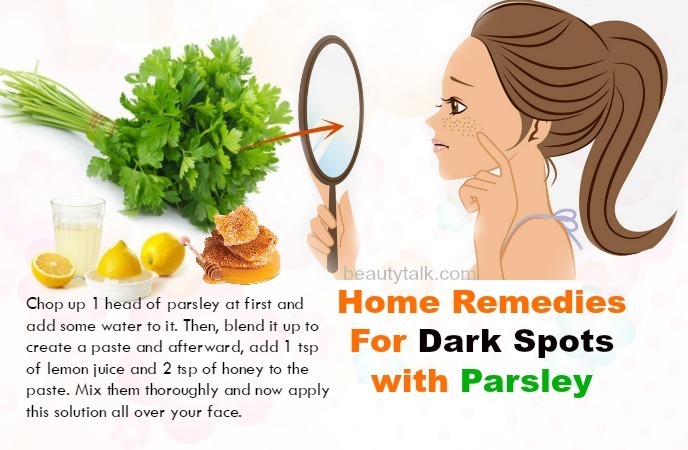 Do you know other home remedies for dark spots we haven’t covered in this post? Which remedy worked best for you? Let us know by leaving a comment.